I have a niece named Katie who at the time was very…headstrong. That means that she usually did what she wanted to do. Someone at our family reunion asked Katie to “Go get Grandpa”. She was six years old at the time. She stood up tall, put her hands on her hips, and said, “It’s not my turn to look for Grandpa!”. We laughed when she said it, but I kept thinking that it sounded like the title of a children’s book. So I wrote it down that phrase on a napkin and stuck it in my idea file. I found the story I’d been looking for! Famed cartoonist George Booth, known for his hilarious, eccentric New Yorker cartoons, has teamed with California children’s author April Halprin Wayland on a book that gives both their talents room to run wild. Wayland, a traditional folk music afficionado, has written a delightful tale in the style of a hill-country folksong. Hardworking Ma does the chores, all the while asking her children “where in the hickory stick is Grandma?” “It’s not my turn to look for Grandma!” each replies. One by one, the children, Mack, Oleanna, Monroe, and Woolie, are sent off to find Grandma, but she’s got her own idea of fun: painting coats, “soaking her bones,” sliding down the haystack, and playing “nine-card stump.” There’s only one sure way to find Grandma: tune up the fiddle. Grandma grabs her banjo and they’re off, playing “The Chickadilla Song” (music included). That’s all George Booth needs to hear. His outrageous artistry sends those jig-dancing children, dirty old dog, two-stepping ducks, nasty porcupines, chickens, pigs, possum, raccoon, owl, and dear ol’ Grandma leaping off the page. George Booth says he drew his first cartoon at the age of three. Since then, his distinctive drawings of cantankerous people, hyperactive animals and bare lightbulbs have graced The New Yorker and many other publications across the country. 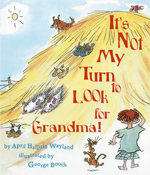 He’s also illustrated, Possum Come a-Knockin’ by Nancy Van Laan, and Wacky Wednesday by Dr. Award-winning children’s author April Halprin Wayland has worked on her family farm and been a country fiddler. Her other books are The Night Horse and To Rabbittown, which has sold more than 50,000 copies, received a starred School Library Journal review, was a Junior Library Guild Selection and was the 1989 “Mommy Care” book of the year.